Meeting today in Jackson, Mississippi, the FirstNet Authority Board and executive team announced plans to develop a Roadmap to enhance the FirstNet network, which will be driven by the needs of the public safety community and reflect industry trends. 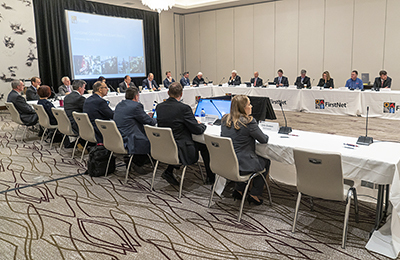 The Board also endorsed a set of principles to guide the FirstNet Authority’s investments in the network — investments that will reflect public safety feedback and priorities for their critical communications needs. For more information on the Board meeting, visit FirstNet.gov. The First Responder Network Authority is an independent authority within the U.S. Department of Commerce. Created in 2012, its mission is to ensure the building, deployment, and operation of the nationwide broadband network that equips first responders to save lives and protect U.S. communities. Learn more at FirstNet.gov/mediakit and follow the FirstNet Authority (@FirstNetGov) on Facebook and Twitter for updates.